Around 200 people took part in a demonstration in Guadalajara on Wednesday to mark the 45th anniversary of the infamous Tlatelolco massacre in Mexico City. 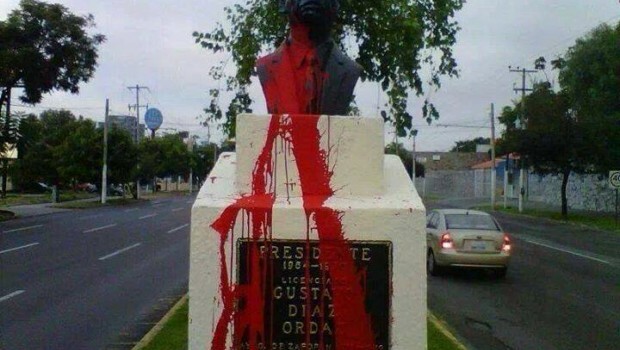 The demonstrators marched along Avenida Alcalde shouting “never forget or forgive,” while others in Zapopan defiled a statue of former President Gustavo Diaz Ordaz, daubing the bust with red paint to symbolize the blood of the hundreds or even thousands of leftist student protestors gunned down by Mexican soldiers on October 2, 1968. After a summer of rising tensions, Ordaz ordered troops to quash a huge student protest in the Plaza de las Tres Culturas, just days before Mexico City was due to host the 1968 Olympic Games. The Institutional Revolutionary Party (PRI) government then covered up the incident and the full extent of the atrocity has only come to light in the 45 years that have passed. Yesterday I came across this brief but moving documentary about the massacre. It’s in Spanish but with English subtitles. Well worth watching. Reblogged this on The Santa Ana Sentinel.